Repairing scratches in polished timber floors is what we do on a weekly basis. For a home owner, it’s a tough road to go down to see their beautiful floors in such a state. No matter how careful you are, at some stage, your beautiful polished dream floors will get marked, scratched or scuffed. Everybody frets that sooner or later someone will push a shopping trolley into their new car. You know it’s going to happen – it’s only a matter of time. In like manner, the same goes for your polished timber floor. The location of the scratch. How long it has been left unattended. A tradesman has dropped something on my floor. A furniture removal company has scuffed my floor. Our tenants have scratched our floors. There is an easy DIY way to reduce the visibility of a scratch. Bunnings sell a product called ‘Waxstix’- a wax touch-up crayon. By all means this is not a proper fix, and as flooring professionals, we do not use these as part of our services. This is a DIY fix for the home owner, or a Band-Aid fix at minimal cost. They come in twelve timber species shades and are versatile. You can also heat them to fill a dent or scratch. You may also blend shades for a real timber grain effect. At only $5.95 a stick, they’re worth a try before calling in a pro. The beauty of these sticks is that you can coat over the repair at a later stage. They have no beeswax in them. This means at a later stage you can have your floor re-coated without any rejection problems. It’s important to understand it still depends on the depth of the scratch. For minor scratches only in the surface of the top coat, then a re-coat of the floor will fix it. To clarify, a light sand of the existing surface and then apply a new top coat. Unless the entire floor area has a re-coat applied at one time, a gloss level variation will be noticeable. That is when you need to consider the location of the repair. Every home is different. A site inspection will ensure the best possible location for a join line. This will reduce visibility of a join. Not every scratch is in the surface of the coating only. Most scratches are from dragging heavy furniture across floors. This type of damage takes the repair work to the next level. The next level of repairing scratches is when a scratch in a floor is also dented. 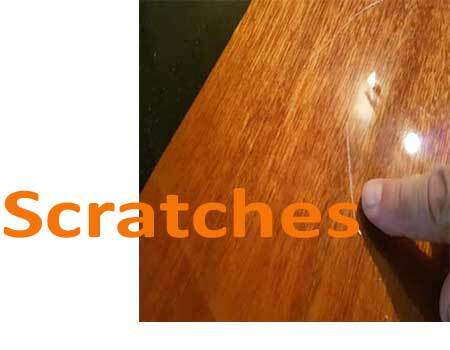 To explain, you can feel an indentation with your fingernail within the scratch. A simple recoat will not repair this damage. For this repair we will need to strip the floor back to raw timber. We will then need to apply the full coating system. Once again, the location will determine if we need to recoat other areas to blend gloss levels. Further, a suitable location for a join line may not always be possible. This would also mean the addition of a recoat of the rest of the polished floor area. The most common forms of indented scratches are from the movement of large furniture. You should not roll or slide furniture over polished timber floors. The most common calls we get are from landlords and tenants. Moving in or moving out are the most crucial times. Fridges sit on 4 small wheels and are very heavy. Track marks from the wheels can occur. There is a method for moving fridges over polished floors without damaging them. Read about it on our polished timber floor care page. In general, your tenancy agreement should include a special clause relating to floor care. This is for both the landlord and also the tenant’s benefit. It should include moving in procedures, as well as general floor care boundaries. Read all about landlords and polished timber floors right here. In addition to repairing scratches we also carry out general floor repairs plus much more. Read about all our timber floor repair services right here.